In 1760, Philip Kefauver deeded 67 acres to the Lutheran and Reformed churches about two miles west of town. A 30′ X 33′ log building was constructed and served as a school and church until the Reformed church first moved to Middletown and the Lutherans shortly also moved. In the 1770’s, the exact date for construction of the first church is not known but was near the revolutionary war period. Money was scarce and it is recorded that the farmers gave wheat, which was made into flour, and afterward exchanged for lumber and labor employed in construction of the church. The church was surmounted by a tower which contained a bell once used on a man of war, and also contained a fine organ. This was truly an auspicious beginning in the new location. The old log church was torn down in 1812 to be replaced by a fine brick building. The brick church was erected on the same site as the first log church. Its dimensions were 40′ X 50′, and cost about $9,000. Church membership had grown significantly; a building committee was appointed and a Baltimore architect was selected. 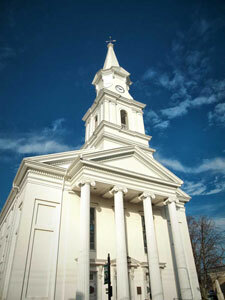 On February 27, 1859 services were held in the old church for the last time. On April 22, 1860, the new church was dedicated with about 2,000 people present. This beautiful structure stands today as the third on the same site. Facing the Old National Pike, the principal route westward for settlement in Ohio and beyond. The congregation of over 600 had committed itself to house of worship of grand proportions, not sparing elegant details. All of this was accomplished not for display but to provide an enduring house of worship and for proclamation of the gospel and administration of the sacrament. Today, Zion Lutheran Church continues to serve its members and the local community.